I’ll give credit where credit is due: Mophie makes excellent power banks. While they’re typically on the pricey side, the style and build quality often make up the difference. However, the company’s latest products, the ‘Powerstation PD’ and ‘Powerstation PD XL,’ eschewed that high level of style and the stunning looks of past models for something more practical. The last Mophie portable charger I used was the brilliant red Powerstation with Lightning connector — which, as I noted before, only works well for iPhone users. The biggest drawback of this power bank was the lack of USB-C ports. However, the new Powerstation PD goes above and beyond solving this problem. Not only does it offer a USB-C port, but it also supports the USB-C Power Delivery (PD) standard and supports up to 18W charging from both its USB-C and USB-A ports. In other words, it can fast charge phones that can handle up to 18W of power, like most new Pixel, Galaxy and Apple phones. To take advantage of the fast charging, you’ll need a compatible phone, a supported USB-C cable, and the power bank. The USB-C port acts as the power bank’s charging port as well, so it’s worth having something that will charge the Powerstation quickly too. If you’re using an Android device, you probably don’t have much to worry about. Chances are, you’ve already got a USB-C cable and a fast-charging brick. Plus, the Powerstation PD comes with a short 28cm USB-C to USB-C cable you can carry with you to connect the power bank to your phone. iPhone users, on the other hand, will have some initial difficulty with the Powerstation PD. First off, you’ll need a USB-C to Lightning cable, which will run you $25 if you go through Apple. However, some third-party options are starting to show up that aren’t as expensive. You’ll also need a UCB-C charging brick or a USB-A to USB-C cable to use the Apple power brick that came with your iPhone. What’s worse, that power brick will charge the Mophie slowly because it only outputs at 5W. Apple’s 18W USB-C adapter costs $39, but again, you can find lower-cost alternatives from other brands. Regardless, iPhone owners picking up the Powerstation PD should expect an additional cost to get the correct cables and chargers. We gained USB-C, but what did we lose? 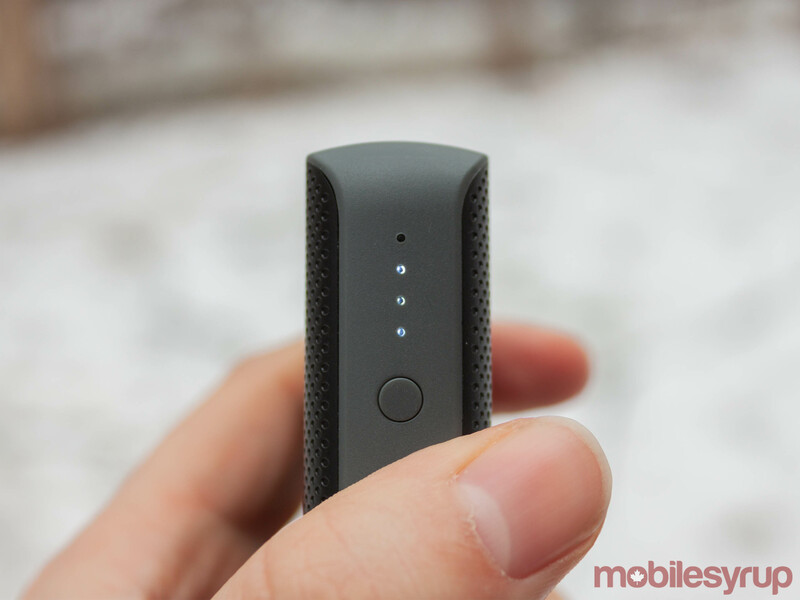 The first thing you’ll notice about the Powerstation PD is it doesn’t look like other Mophie batteries. 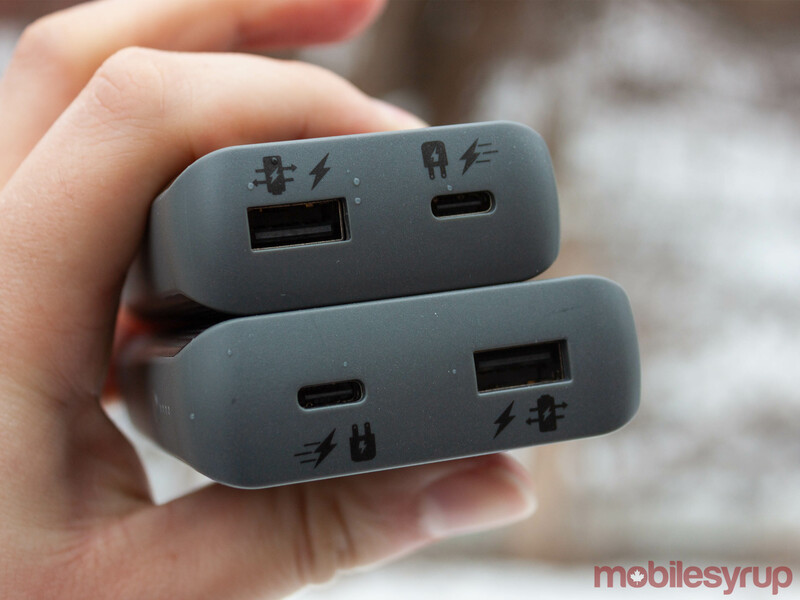 While changing up your look isn’t necessarily a bad thing, I feel the Powerstation PD is a step back for Mophie. Gone are the lovely colours, excellent build materials, and generally solid craftsmanship of past products. Instead, the PD is all plastic, with a light grey band around the sides and a textured black plastic on the front and back. The textured plastic isn’t bad — it feels nice in hand and looks decent, but it doesn’t compare to past models. Even the last Powerstation featured an aluminum front and back plate. Plus, the PD only comes in one colour: dull grey and black. Colours aside, there’s one other issue with the Powerstation PD’s plastic shell: if you grip it with any force, it will creak and shift. Again, this isn’t necessarily bad, but in a premium product like the Powerstation PD — and considering Mophie’s past products — it’s disappointing to see this level of quality. However, it’s not all bad news for the Powerstation PD. It still sports a side button that lights up LEDs to indicate charge level, something I quite enjoy about the Mophie batteries. The Powerstation PD is also impressively small for the amount of charge it holds. The regular size comes in at 6,700mAh while the PD XL is 10,050mAh. Additionally, the Powerstation PD is light, which is one benefit of its plastic exterior. Despite its shortcomings, the Powerstation PD is the best Mophie power bank you can buy right now. What it gives up in style, it makes up for in functionality. I, for one, would take the PD’s USB-C and fast charging over any of the fancier power bank offerings. 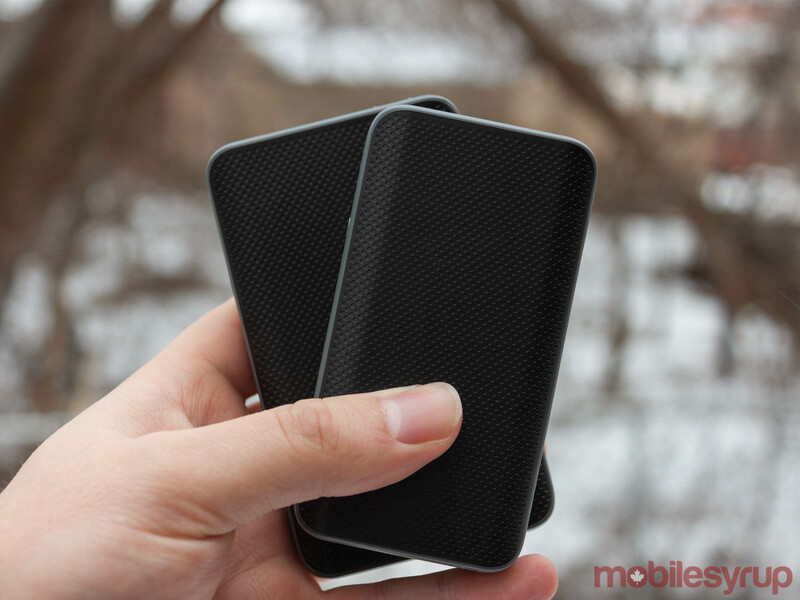 Unfortunately, outside of the Mophie ecosystem, the Powerstation PD doesn’t fare as well. It’s an expensive power bank, clocking in at about $80 CAD for the 6,700mAh version and $105 for the 10,050mAh model. That’s a lot of money for a portable charger, and when you consider there are options out there for less than $70 CAD with 20,100mAh capacity — double that of the PD XL — it quickly becomes hard to justify. This is where that premium argument would typically come in. In my story about the Powerstation with Lightning connector, I noted that the premium price of the power bank was justifiable if you cared deeply about the style of your portable battery, or if you were heavily invested in Apple’s ecosystem. There’s no such saving grace for the Powerstation PD. iPhone users will need extra cables to make this power bank work, making it less than ideal for them. Android users will be good to go out of the box, but the build of the PD doesn’t do enough to set it apart from the competition. 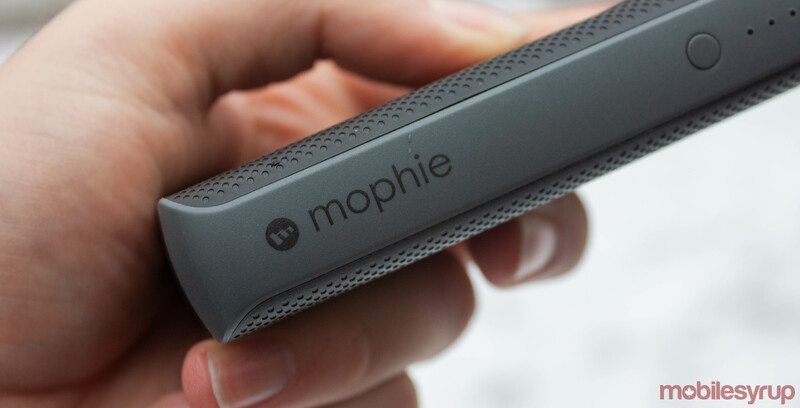 Canadians will feel an extra burn as well, as Mophie’s website only offers U.S. pricing (I converted the above prices based on the exchange rate at the time of writing). Eventually, the Powerstation PD will come to Canadian stores, but for now, you’ll have to buy online, which means you’ll pay shipping too. None of this is to say the Powerstation PD isn’t good. 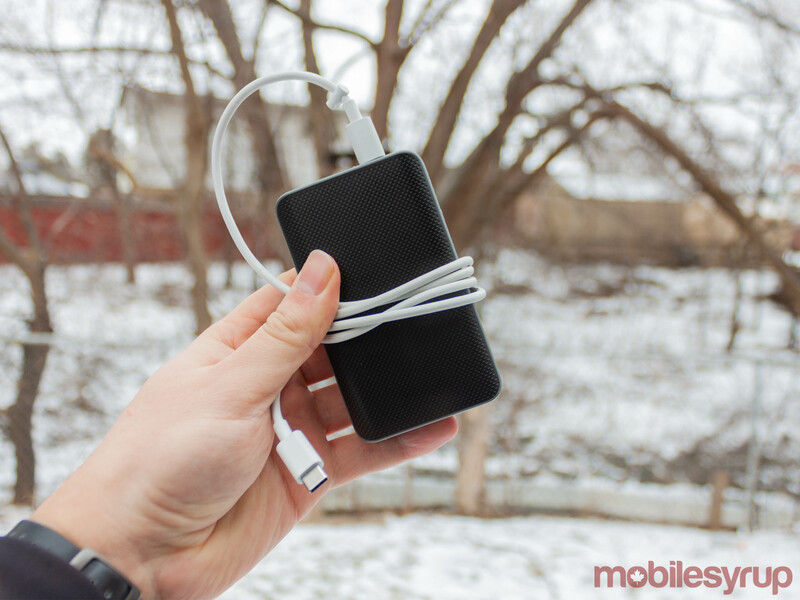 It’s a great portable charger, and at the right price, it’s an excellent option. However, I’d argue that the current price isn’t the right price for what the Powerstation PD offers users.